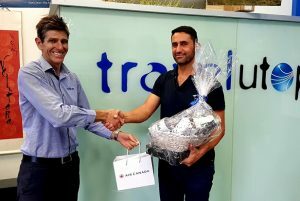 Central Coast resident, Michael Tripolone, is planning the holiday of a lifetime after winning two return flights to Canada plus travel insurance, courtesy of Erina travel agency, Travel Utopia, Air Canada, and SureSave. Celebrating ten years in business, Travel Utopia gave customers the chance to enter the draw to win two Air Canada return flights to Canada throughout the month of October. The winner was drawn at Travel Utopia’s birthday party this month. With nearly 100 years combined experience, the team at Travel Utopia offers special expertise in Canada, offering the best rates on the market for airfares, accommodation and sightseeing. 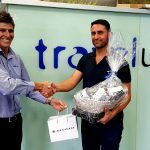 “We want to celebrate our milestone by giving back to the community that supports us, whether it’s through local sponsorships or simply by giving our loyal customers the chance to get away on us!” says Greg Mangos, co-owner at Travel Utopia. Killarney Vale residents, Jeanice and Tony Gibson won the runner-up prize of two nights at Chateau Elan in the Hunter Valley, including breakfast and golf. “We can’t wait for our wonderful weekend away at Chateau Elan,” says Jeanice. “We want to thank the whole team at Travel Utopia for always taking the time to listen to our travel plans and offer fantastic advice. Visit Travel Utopia on the ground floor of the Platinum Building on Ilya Ave, Erina, next to Quattro Restaurant, behind Fountain Plaza, or phone 1300 31 21 31.